I haven't bought a physical PlayStation 4 game yet, but Square Enix is really tempting me with my desire to play JRPGs straight from a box. The company is taking its time jumping into the next-gen race, but with two Final Fantasy games lined up, who could possibly continue to turn a blind eye? First up is Final Fantasy Type-0 HD, a next-gen port of the previously unlocalized PSP game. I'd rather be playing it on my PS Vita, but if that is not an option, then I guess the console is the next best place to do so. The PlayStation 4 version will come packed with a naturally huge "Collector's Edition" clocking in at a whopping $99.99. What does the extra $40 on top of the standard price land you? The star of the bundle is a 200 page manga that serves to set up the game. This will be accompanied by a SteelBook case, an 80 page art book, a copy of the game's soundtrack, and 5 cards used by a playable character named Ace as projectile weapons. Gambit would be proud. 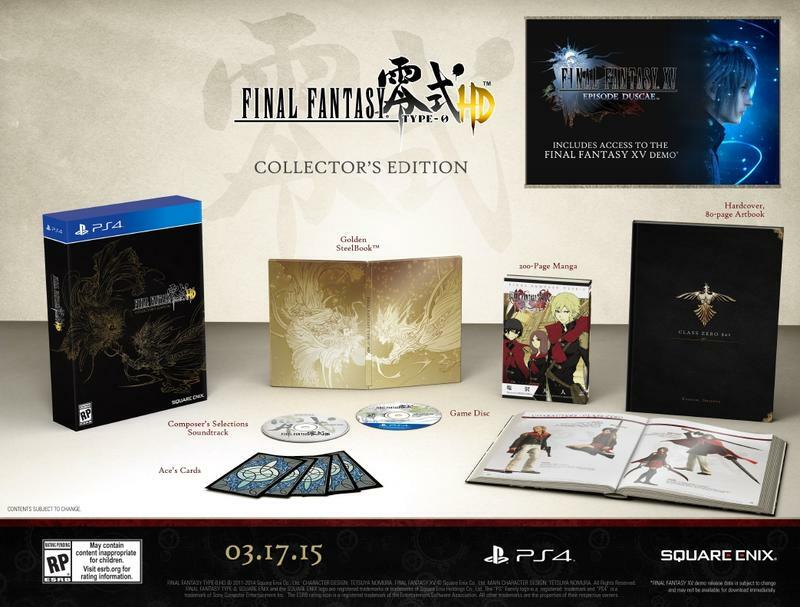 The Collector's Edition also comes with the most important bonus from Final Fantasy Type-0 HD, the playable demo of Final Fantasy XV. However, you can also snag this through the standard edition as well. Seeing as the main game and the demo are all I'm really interested in, I'm going to just be sticking with that. I collect games, not game swag. The big question though is if I want it on a disc or as a digital copy. I mean, it's Final Fantasy! I even own Final Fantasy XIV: A Realm Reborn on a disc, and that was simply an install disc that was unneeded after the first use. Final Fantasy Type-0 HD will be released for the PlayStation 4 and Xbox One on Mar. 17th.